Everyone knows that back-to-school season can be incredibly stressful. You have new clothes to buy, new schedules to arrange, classes to sign up for—and the days are getting shorter and shorter. But here’s the good news: no longer does back-to-school shopping mean waiting until the day before school starts to wait in endless checkout lines for pens and paper. To save time during an already stressful part of the year, plan ahead and get everything you need for school well before the first bell rings. Whether you need to outfit a dorm room or just want to stock up on the basics, here are the best places to buy school supplies online this year. And don’t forget that you can DIY some supplies and get organized to help keep your kiddos busy through the dog days of summer. You probably have Amazon bookmarked in your browser for buying everything from books to shampoo to furniture, but it’s also a great place to stock up on school supplies. Amazon offers over 200,000 items categorized as school supplies and allows you to filter by only Prime-eligible items if you want to cash in on the free shipping. 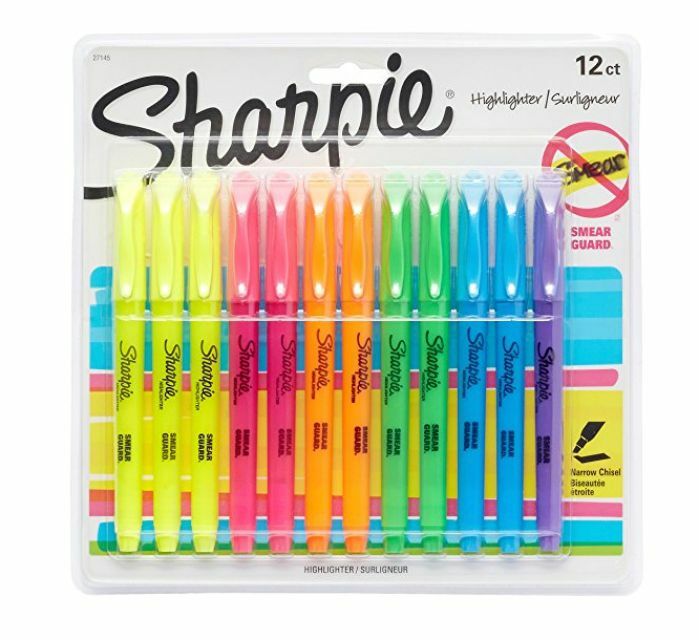 You can find everything from Sharpies to notebooks to pencil sharpeners but bear in mind that Amazon often offers items in bulk or larger quantities than you might find at your local store. That said, there’s pretty much nothing you can’t buy on Amazon, including those textbooks and required reading materials, so it’s an easy way to knock out all of your shopping in one fell swoop. Amazon’s customer service is what makes it a top choice for customers year after year. You can also sign up for “Subscribe and Save” to take money off your bill and auto-replenish things like paper, pens, and more. If you want the easiest school supply shopping experience, give Amazon a go. Want something a little more customized? Here’s our list of the best notebooks you can personalize. Walmart is a standby when it comes to back-to-school, and we don’t see that changing anytime soon. Walmart’s online interface lets you sort by category, such as pens, calculators, notebooks and more—and even has a separate shop for teacher supplies. Walmart also has pages dedicated to high school and college students that feature trendier items and designs, making it easy to quickly track down age-appropriate items for your kids. You may not find as many options on Walmart’s website as you would on Amazon, but the prices are likely to be more competitive. Plus, you can return in-store if you change your mind about any purchase—and Walmart offers two-day shipping on many of their items. If you’re looking to stock up on the basics without putting too much stress on your wallet, Walmart is a great choice. Another solid option for online school shopping (but with the convenience of a nationwide brick-and-mortar brand) is Target. The retail giant offers over 10,000 items categorized as school supplies and is the best choice for more curated or design-forward items. If your child has an eye for style, they’ll love the variety of patterned notebooks and snazzy backpacks available here. Not only will you find the standard markers, pens, and paper, but you can also find office and desk items from brands such as All Day Designer. If you’re hunting for school supplies that are attractive and low-cost, Target offers one of the widest selections around. Many of their items come with a two-day shipping option as well as in-store pickup. Whether you want to outfit your dorm’s study space using Hearth & Hand with Magnolia items (hint: a well-designed office space can result in increased productivity) or you just need to cover the basics, Target is a convenient and well-priced place to shop that will have everything you need for back-to-school season. Check out our list of the best fountain pens to up your writing game. For everything you need for school (and more! ), Staples is a great choice. This standby offers a much wider selection of school supplies than nearly anyone on our list and is great for niche needs such as specifically sized note cards, poster boards, and more. They even offer a wide selection of electronics, desk chairs, and backpacks. Beyond back-to-school season, it’s a great place to get all the supplies your child needs for that big class presentation or group project they’ve got coming up. The Staples website lets you shop by school age, and many items have the option to pick-up in just an hour. You can narrow options down by those that are available same-day, as well as by category. Staples is a great one-stop shop for every single thing you need for class, especially if you’ve procrastinated and put off shopping until the night before the first day of school. Here are our favorite computer desks that you can buy right now. If your child is heading to college for the first time, you’ll have a laundry list of dorm essentials to buy. For everything dorm-related and more, Bed, Bath & Beyond is the best choice. Not only can you purchase sheet sets, a shower organizer, laundry basket, and microwave, but you can also outfit a desk or office with standard supplies as well. Though they’re not the best choice for basics, you can buy higher-end office supplies such as designer staplers, letter openers, and wall calendars. For kids going away to college, you can also shop at your local Bed, Bath & Beyond and pick up at the location closest to your school. One of the best features of the online Bed, Bath & Beyond website is their school finder option, which allows you to find your college and view residence requirements and restrictions—so you know what is allowed (and what isn’t) before you head to your first day. If you need to outfit a home office or a dorm room, there’s no better choice than Bed, Bath & Beyond. Plus, you can use their famous 20 percent off coupons for most items on their shelves. Back-to-school doesn’t just mean pens and paper anymore—many students now require laptops, tablets and more, and Best Buy is the best stop for anything tech-related. Best Buy has frequent back-to-school sales and even offers a “Student Hub” to help narrow down the best laptop for your student’s needs. Many college students can also qualify for special pricing on certain devices to save up to $100. Best Buy offers a 14-day return policy on their goods, so you can return if the product doesn’t suit your needs. Though Amazon and other retailers also sell tech products, Best Buy is still one of the top choices when it comes to computers. If you purchase device protection, the brand’s GeekSquad provides hands-on diagnostics if there are any problems with your device. Now, all you have to focus on is setting up that perfect home office. A slightly more off-beat choice, Oriental Trading offers a surprisingly wide selection of school supplies for both teachers and students. Most items are sold in bulk, so expect packages of 200 pencils or hundreds of erasers—but if you’re a teacher or a parent to multiple children, it can be cost-effective to buy larger quantities and get your shopping for the full year done in one fell swoop. Plus, not only does it sell everything from notepads to pens to scissors, many of their products have a fun spin to them (and are a little more unique than your standard Bic, for example). We love their unique pencil cases, sharpeners, and backpacks, which have a whimsical touch that younger kids will love. Though most items will take a little longer to get to you than it would if you were using Amazon or another major brand, Oriental Trading is a great choice for educators and parents who want something a little more fun and unique than the standard school supply offerings.